Today feels too dense with terrible things. Syria, the election, Dakota pipeline… and so much more. These things create a block in the brain and the heart; ones that need to occur because they have meaning but today, when faced with blogging, I can’t get words out, thoughts out to convey my feelings towards it all. Instead, a story came to mind. It doesn’t relate to any of this but it popped into my head as I was contemplating my apoplexy towards current events. It is a short story by Jun'ichirō Tanizaki. It was written in 1910. You can find this and other short stories by him in a collection entitled, Seven Japanese Tales. I found this online so this might be off a bit and the spacing is most certainly off. If you enjoy it read more of Tanizaki. He is a writer I re-read often. It was an age when men honored the noble virtue of frivolity, when life was not such a harsh struggle as it is today. It was a leisurely age, an age when professional wits could make an excellent livelihood by keeping rich or wellborn young gentlemen in a cloudless good humor and seeing to it that the laughter of Court ladies and geisha was never stilled. In the illustrated romantic novels of the day, in the Kabuki theater, where rough masculine heroes like Sadakuro and Jiraiya were transformed into women – everywhere beauty and strength were one. People did all they could to beautify themselves, some even having pigments injected into their precious skins. Gaudy patterns of line and color danced over men’s bodies. Visitors to the pleasure quarters of Edo preferred to hire palanquin bearers who were splendidly tattooed; courtesans of the Yoshiwara and the Tatsumi quarter fell in love with tattooed men. Among those so adorned were not only gamblers, firemen, and the like, but members of the merchant class and even samurai. Exhibitions were held from time to time; and the participants, stripped to show off their filigreed bodies, would pat themselves proudly, boast of their own novel designs, and criticize each other’s merits. There was an exceptionally skillful young tattooer named Seikichi. He was praised on all sides as a master the equal of Charibun or Yatsuhei, and the skins of dozens of men had been offered as the silk for this brush. Much of the work admired at the tattoo exhibitions was his. Others might be more noted for their shading, or their use of cinnabar, but Seikichi was famous for the unrivaled boldness and sensual charm of his art. Seikichi had formerly earned his living as an ukiyoye painter of the school of Toyokuni and Kunisada, a background which, in spite of his decline to the status of a tattooer, was evident from his artistic conscience and sensitivity. No one whose skin or whose physique failed to interest him could buy his services. The clients he did accept had to leave the design and cost entirely to his discretion – and to endure for one or even two months the excruciating pain of his needles. 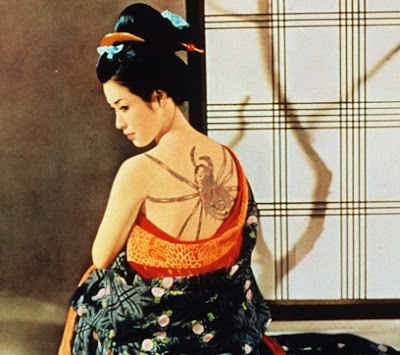 For a long time Seikichi had cherished the desire to create a masterpiece on the skin of a beautiful woman. Such a woman had to meet various qualifications of character as well as appearance. A lovely face and a fine body were not enough to satisfy him. Though he inspected all the reigning beauties of the Edo gay quarters he found none who met his exacting demands. Several years had passed without success, and yet the face and figure of the perfect woman continued to obsess his thoughts. He refused to abandon hope. One summer evening during the fourth year of his search Seikichi happened to be passing the Hirasei Restaurant in the Fukagawa district of Edo, not far from his own house, when he noticed a woman’s bare milkwhite foot peeping out beneath the curtains of a departing palanquin. To his sharp eye, a human foot was as expressive as a face. This one was sheer perfection. Exquisitely chiseled toes, nails like the iridescent shells along the sore at Enoshima, a pearl-like rounded heel, skin so lustrous that it seemed bathed in the limpid waters of a mountain spring – this, indeed, was a foot to be nourished by men’s blood, a foot to trample on their bodies. Surely this was the foot of the unique woman who had so long eluded him. Eager to catch a glimpse of her face, Seikichi began to follow the palanquin. But after pursuing it down several lanes and alleys he lost sight of it altogether. Seikichi’s long-held desire turned into passionate love. One morning late the next spring he was standing on the bamboo-floored veranda of his home in Fukagawa, gazing at a pot of omoto lilies, when he heard someone at the garden gate. Around the corner of the inner fence appeared a young girl. She had come on an errand for a friend of his, a geisha of the nearby Tatsumi quarter. “My mistress asked me to deliver this cloak, and she wondered if you would be so good as to decorate its lining,” the girl said. She united a saffron-colored cloth parcel and took out a woman’s silk cloak (wrapped in a sheet of thick paper bearing a portrait of the actor Tojaku) and a latter. The letter repeated his friend’s request and went on to say that its bearer would soon begin a career as a geisha under her protection. She hoped that, while not forgetting old ties, he would also extend his patronage to this girl. “I thought I had never seen you before,” said Seikichi, scrutinizing her intently. She seemed only fifteen or sixteen, but her face had a strangely ripe beauty, a look of experience, as if she had already spent years in the gay quarter and had fascinated innumerable men. “I have waited five years for you. This is the first time I have seen your face, but I remember your foot. ... Come in for a moment, I have something to show you.” She had risen to leave, but he took her by the hand and led her upstairs to his studio overlooking the broad river. Then he brought out two picture scrolls and unrolled one of them before her. It was a painting of a Chinese princess, the favorite of the cruel Emperor Chou of the Shang Dynasty. She was leaning on a balustrade in a languorous pose, the long skirt of her figured brocade robe trailing halfway down a flight of stairs, her slender body barely able to support the weight of her gold crown studded with coral and lapis lazuli. In her right hand she held a large wine cup, tilting it to her lips as she gazed down at a man who was about to be tortured in the garden below. He was chained hand and foot to a hollow copper pillar in which a fire would be lighted. Both the princess and her victim – his head bowed before her, his eyes closed, ready to meet his fate – were portrayed with terrifying vividness. As the girl stared at this bizarre picture her lips trembled and her eyes began to sparkle. Gradually her face took on a curious resemblance to that of the princess. In the picture she discovered her secret self. “Your own feelings are revealed here,” Seikichi told her with pleasure as he watched her face. “Why are you showing me this horrible thing?” the girl asked, looking up at him. She had turned pale. “The woman is yourself. Her blood flows in your veins.” Then he spread out the other scroll. This was a painting called “The Victims.” In the middle of it a young woman stood leaning against the trunk of a cherry tree: she was gloating over a heap of men’s corpses lying at her feet. Little birds fluttered about her, singing in triumph; her eyes radiated pride and joy. Was it a battlefield or a garden in spring? In this picture the girl felt that she had found something long hidden in the darkness of her own heart. “This painting shows your future,” Seikichi said, pointing to the woman under the cherry tree – the very image of the young girl. “All these men will ruin their lives for you.” “Please, I beg of you to put it away!” She turned her back as if to escape its tantalizing lure and prostrated herself before him, trembling. At last she spoke again. “Yes, I admit that you are right about me – I am like that woman... So please, please take it away.” “Don’t talk like a coward,” Seikichi told her, with his malicious smile. “Look at it more closely. You won’t be squeamish long.” But the girl refused to lift her head. Still prostrate, her face buried in her sleeves, she repeated over and over that she was afraid and wanted to leave. “No, you must stay – I will make you a real beauty,” he said, moving closer to her. Under his kimono was a vial of anesthetic which he had obtained some time ago from a Dutch physician. The morning sun glittered on the river, setting the eight-mat studio ablaze with light. Rays reflected from the water sketched rippling golden waves on the paper sliding screens and on the face of the girl, who was fast asleep. Seikichi had closed the doors and taken up his tattooing instruments, but for a while he only sat there entranced, savoring to the full her uncanny beauty. He thought that he would never tire of contemplating her serene masklike face. Just as the ancient Egyptians had embellished their magnificent land with pyramids and sphinxes, he was about to embellish the pure skin of this girl. Presently he raised the brush which was gripped between the thumb and last two fingers of his left hand, applied its tip to the girl’s back, and, with the needle which he held in his right hand, began pricking out a design. He felt his spirit dissolve into the charcoal-black ink that strained her skin. Each drop of Ryukyu cinnabar that he mixed with alcohol and thrust in was a drop of his lifeblood. He saw in his pigments the hues of his own passions. Soon it was afternoon, and then the tranquil spring day drew toward its close. But Seikichi never paused in his work, nor was the girl’s sleep broken. When a servant came from the geisha house to inquire about her, Seikichi turned him away, saying that she had left long ago. And hours later, when the moon hung over the mansion across the river, bathing the houses along the bank in a dreamlike radiance, the tattoo was not yet half done. Seikichi worked on by candlelight. Even to insert a single drop of color was no easy task. At every thrust of his needle Seikichi gave a heavy sigh and felt as if he had stabbed his own heart. Little by little the tattoo marks began to take on the form of a huge black-widow spider; and by the time the night sky was paling into dawn this weird, malevolent creature had stretched its eight legs to embrace the whole of the girl’s back. As if in response to these words a faint moan came from the girl’s lips. Slowly she began to recover her senses. With each shuddering breath, the spider’s legs stirred as if they were alive. “You must be suffering. The spider has you in its clutches.” At this she opened her eyes slightly, in a dull stare. Her gaze steadily brightened, as the moon brightens in the evening, until it shone dazzlingly into his face. “Let me see the tattoo,” she said, speaking as if in a dream but with an edge of authority to her voice. As she left the tub, too weak to dry herself, the girl pushed aside the sympathetic hand Seikichi offered her, and sank to the floor in agony, moaning as if in a nightmare. Her disheveled hair hung over her face in a wild tangle. The white soles of her feet were reflected in the mirror behind her. Seikichi was amazed at the change that had come over the timid, yielding girl of yesterday, but he did as he was told and went to wait in his studio. “All my old fears have been swept away – and you are my first victim!” She darted a glance at him as bright as a sword. A song of triumph was ringing in her ears. “Let me see your tattoo once more,” Seikichi begged. Silently the girl nodded and slipped the kimono off her shoulders. Just then her resplendently tattooed back caught a ray of sunlight and the spider was wreathed in flames.